We already had pizza twice this week. Melampau sungguh. Ni semua nafsu! Cewah tapi hari ni still nak makan pizza lagi. I once tried pizza recipe somewhere but it didnt turn out as what we hoped for. So I tried another recipe from HERE and boyyyy my pizza dough was better than Pizza Hut's. hahaha. I followed all the steps but my dough still sticky before I decided to stop kneading. Burn it to 240degree for 5 minutes and reduced to 220degree for 15minutes. 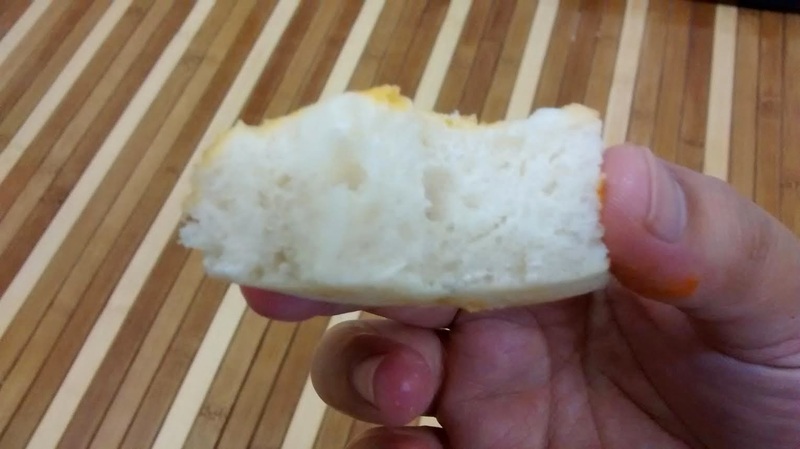 Dah nama pun belajar, test la kan ape lagi but wohoottt the dough is fluffy,gebu and sedappppp! I just need to improve on the topping sebab hari ni I just simply used Kimballs Spaghetti sauce - gile malas nk properly cook with onion bagai. 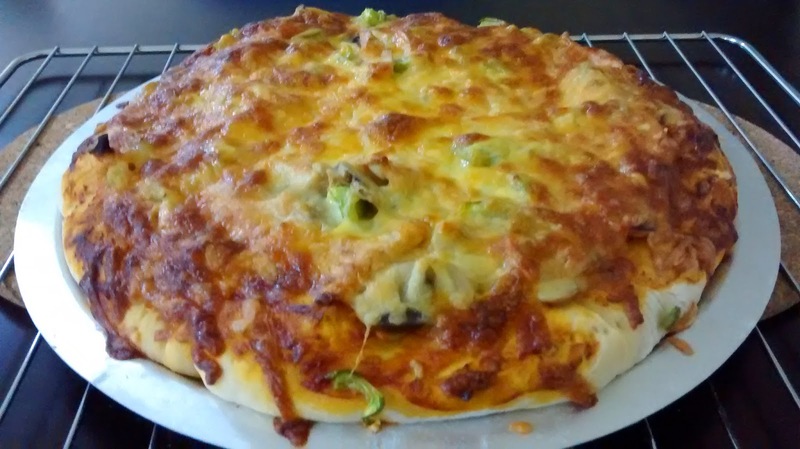 Tambah button mushroom, capsicum, sausages and plenty of cheese! It was Monday and coincidently Husband supposed to be in KL for a night. I decided to tag along, in case we could celebrate it somewhere that day. Tapi mestilah tak. 5 hours journey after work and reach around 10pm, semua kedai dah tutup. Nak tgk water fountain pon xsempat. Luckily Umie suggested to celebrate her birthday last Saturday evening. Kebetulan all of our siblings at home and it was the 6th day of Raya, boleh ajak orang dtg makan terus. Thank you for her Tok saudara, auntie's and uncles's friend yang memeriahkan majlis. Makanan semua licin sampai kene topup skali lagi. Birthday girl kembali ceria lepas tdo sejam. Tu pun Nekmi die kejut nak ambik family photo. 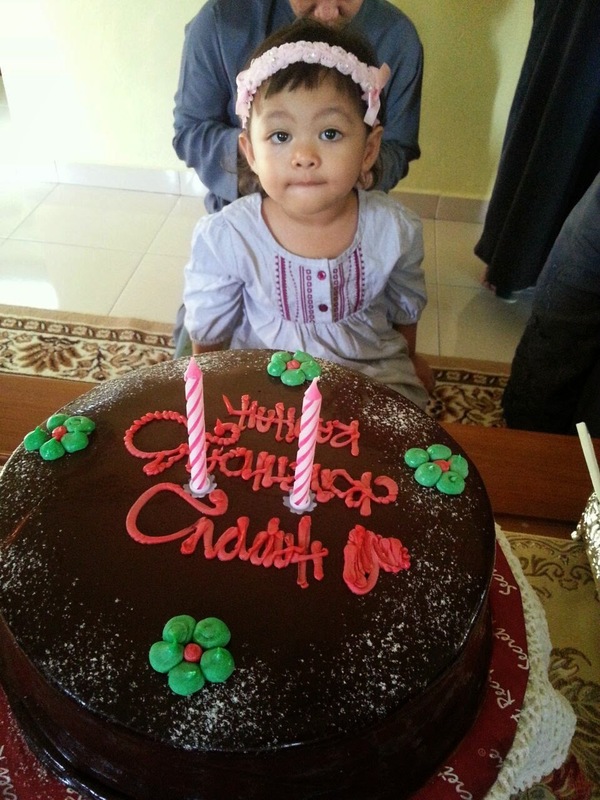 Dear Rauhah, happy birthday sayang. Thank you for teaching us the meaning of parenthood. You had give us so much thing to look up to and we pray non-other than all of the happiness in this world and hereafter. Ibu and Abi loves you so much!